Next morning we started our day with a rich south-Indian breakfast in the mess and got ready around 7:30 am. While it was still drizzling, we boarded our vehicle for further excursion to Rishikesh, the place where Himalaya embraces Ganga as she goes forth on her pious journey quietly but purposefully. 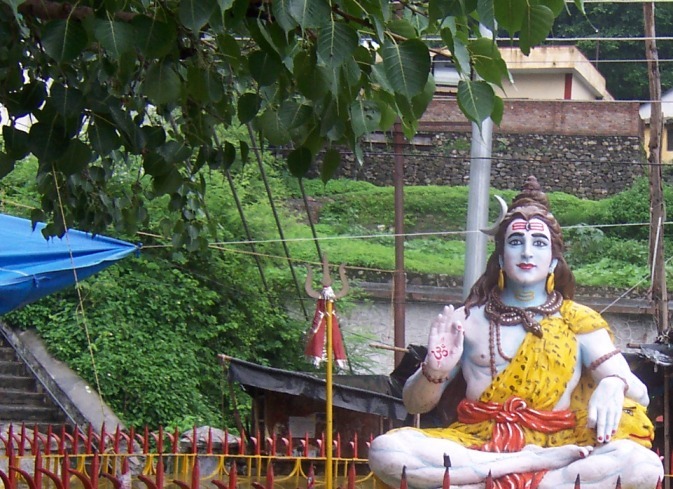 Rishikesh is not a pilgrimage destination devoted to any particular place of worship or diety. Rather it is a site of multifarious spiritual practices at the various splendid ashrams spread out in sprawling acres of land, beating any modern-day spa. 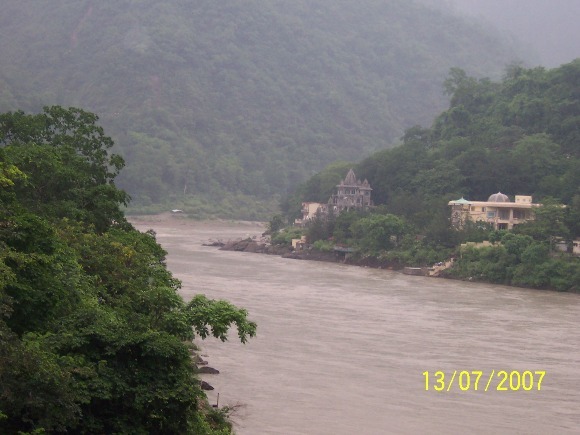 Rishikesh is 24 Kms away from Haridwar, so it would be maximum 45 mins of drive. 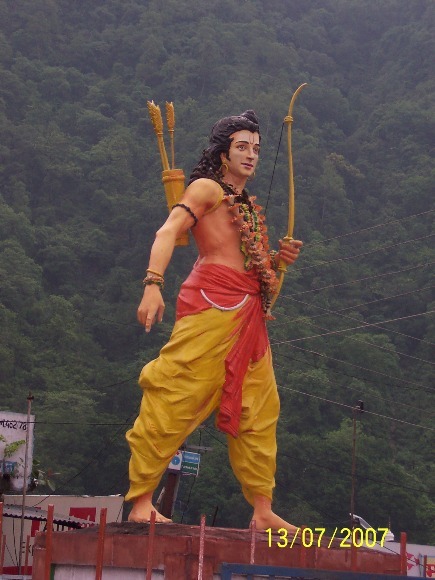 This would be my first visit to Rishikesh. Reaching there, we got down from our vehicle at a local tea stall and refreshed ourselves with a cup of hot tea. After having some snacks we got ready for our expedition for Rishikesh in a heavy vehicle like Jeep, suitable for the rough roads of Rishikesh in the hilly areas. We had to leave our car behind, as the driver said it would suffer in the rugged terrain. A Morning in Rishikesh gives an exhilarating, panoramic view. We could get to see the breathtaking beauty of Himalayas and free-flowing Ganga in its verdant foothills. It would be just so energizing to view it from the balcony of your rooms if you get to stay here, mused I wistfully. After breakfast we would continue our exploration of this land of saints and sages and also spend the day in adventurous activities such as shopping :P.
Around 9:00 am , we would drive towards Bharat Mata Mandir , situated in the heart of Rishikesh. The Bharat Mata Mandir is said to be the oldest temple here. & making a round of temple would give you deep knowledge and understanding of Hindu Mythology. So finally we reached and paid for our first visit to Lakshman Jhoola , the famous 450 foot long suspension bridge. You got plenty of opportunity of photography in the not-at-all tranquil environment of Rishikesh from the Lakshman Jhoola. 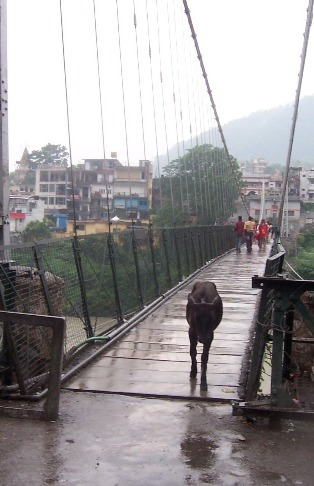 There were endless monkeys, too many people (I almost feared if the bridge would break! ), the noisily gushing Ganga and of course, beggars galore in all sorts of assortments. I wanted to click the monkeys, but dared not for fear of getting the camera snatched. 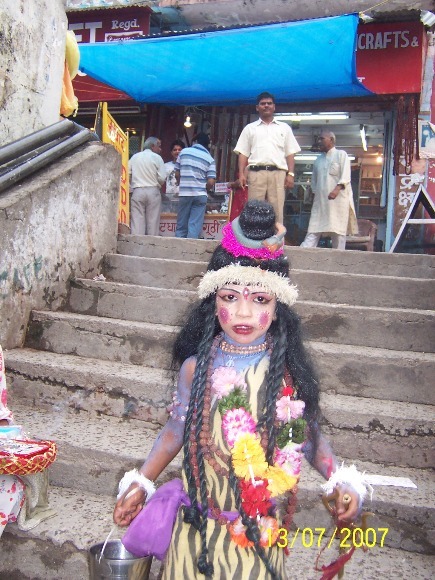 While on the stairs to Lakshaman Jhoola, I tried clicking a boy dressed to kill Ravana (in short, he was all blue and ethnically done up as Lord Rama). the moment I clicked him shut in the camera, the entire family descended upon me for the price of taking that precious snap of Lord Rama”. Uff! MY Gawd! We had a tough time getting away from them, they happily haggling for a cool Rs. 500 note when we all thought the easily available pic in abundance didn’t deserve him more than 20 bucks! anyway, i had to part with 4 tenners coz as I handed over 3, he snatched the fourth one and the entire family too vanished in a jiffy. Since I had already bought some daily wear hand-made ornaments, I was forbidden to go for more of them. (according to dad, enough of kitschy stuff gurl !) Huh! Anyway, I still ended up buying a pair of danglers, a carved Ganesha idol, and yes, several pairs of Afghanis, in various colors! 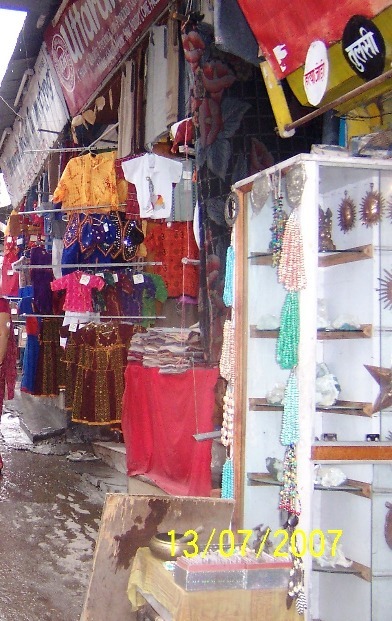 (kind of flared salwars, very unique then to the market, being worn mainly by the foreigners visiting Rishikesh). After all, girls are meant to shop till we drop! 😉 😛 I don’t know how it happened, but the day was passing away fast. We meandered into the bazaar selling lots of traditional stuff, from carved book-cases to wooden room partitions, boxes with mirrors and inlay work, stuff made from bones of animals and all (I wonder if it wasnt plastic!) and also, mehandi thappas. We couldn’t get the right price for the henna stamps, but we bought a wodden lemon squeezer and several packets of shikanji masala for the perfect shikanji while daddy screamed for us to get out to begin our return journey. Well, we moved ahead and on crossing the jhoola, the rain welcomed us, and we loved it! We had carried just one umbrella incidentally, and it was such a lucky co-incidence that crude blue rain coats made out of recycled polythene were being sold for a mere Rs 10! LOVE U INDIA ! IT HAS A JUGAAD EVERYWHERE! 😉 Dad sportingly took it up on him to wear it while bro, the macho dude that he is, decided to opt out of any cover. Mom and me shared the umbrella, if it at all gave us any cover, and the little it did, I soon outdid! I was soooo delighted in the fresh oxygenated environment that i jumped about like a kid, stopping at every nook and corner, my eager eyes exploring a secret, hidden or not, in the narrow gulleys of this sage city. As we moved ahead, we saw a lot many places and ashrams, and with the swirling waters of Ganga gushing below, the sight was calming and a visual solace to a poetic soul. With the markets flanked on both sides, colourful knickknack shops adorned the black wet roads. 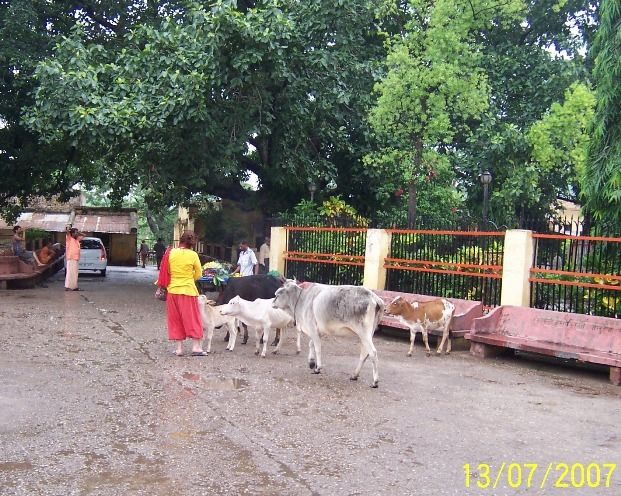 From there we could have visited the Lakshman and Raghunath Temples, Muni ki reti and Trayambhkeshwar Temple. In the evening after sunset around 7:00 pm it is wonderful to go to Triveni Ghat. It is believed that the confluence of Ganga,Yamuna and Saraswati took place here. This ghat of sand and pebbles is large and clean. Spend some time on the ghat and participate in the Aarti. Feels like spiritual reclaim. Further people drive towards Shivpuri , 30 Kms away from Rishikesh, popular for water sports. For adventure enthusiasts , this is the right place to come. If you love to get wet, savor the thrill of raw adventure or the relaxation of a float trip. Also enjoy kayaking, rock climbing, rappelling, jungle trekking and beach games, plenty of things to do here. You might be hungry after much of activities , for your better surprise, you can have arranged camps for yourself from travel & event companies that organise adventure sports for sports buffs, and also relish the freshly cooked foods in the camp. You can spend some leisure time here, relaxing , playing or just nature walk , the perfect base camp for body and mind. After much of gaming and thrilling its time to move back, as it gets dark and for the safety sakes you should return to Rishikesh before late night. Then go have dinner at hotel & sleep on your cozy beds with the sweet memories of this trip..